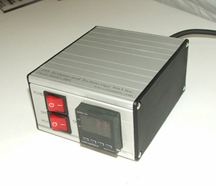 STI Temperature Controllers allow for accurate Digital Temperature Control of Mech-El Hot Plates.Our Plug interface fits all Mech-EL Hot Plates, just plug it in. Our Controller units have Alarm setband of High, Low, High/Low settings, Alarm condition will cut off power to the Hot Plate.Simple operation with Two control switches, one for Power and the other for Heat ON/OFFcontrol. The unit works with a zero Cross over Solid State Relay and a separate safety Alarm Relayto insure power is cut off in case of an Alarm condition. The Heat ON/OFF switch allows the Heatto be turned OFF and will indicate the temperature of the Hot Plate while no heat is applied.Operating voltage of 120.